Sixty years ago I was where you graduates are now, but graduating from the University of Toronto. 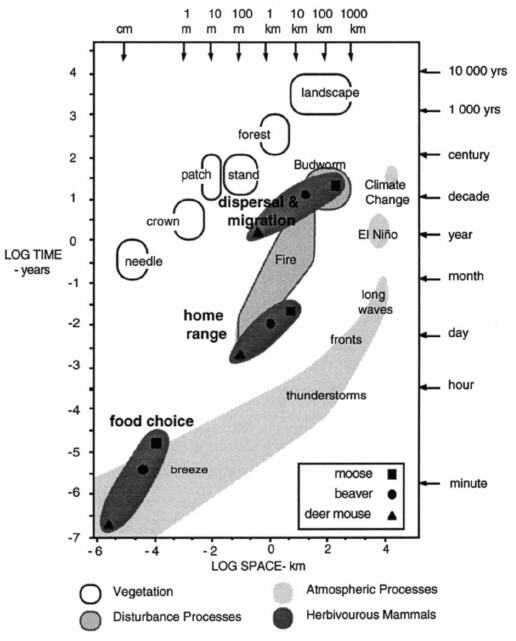 By the time I got my PhD a few years later, I was well launched on a goal to understand population processes. It was the unknown that beckoned me and simple curiosity that motivated me. The goal was to develop suites of models and experiments that could yield explanations and understanding that were simultaneously precise, realistic, holistic and general. For that time, just before computers became available, that was viewed as being unnecessarily complex. After all, one distinguished ecologist asked me, if you are interested in the time a ball takes rolling downhill, why worry about anything more than the height of the hill and its slope? General laws of physics will provide the answer. But I was stubbornly curious about the path down the hill, the bumps and valleys that the ball might encounter and the momentary pauses as the ball encountered, or even, over several runs, created a shallow valley. That led to really delightful experimental studies of predators and prey leading to generalized models and sudden discoveries from them. The beasts used in the experiments depended on the question of the moment – Preying Mantis, deer mice, shrews, then birds, fish and stalking lions. The early computers and languages like Fortran suddenly provided the language that could use the experimental and field results. Models plus reality combined to yield broadened, generalized understanding of a small number of classes of predation. That is when I discovered multi-stable states – population systems were not driven only by attraction to a single equilibrium state but, instead, there were several equilibrium states that determined their existence. And the goal for understanding and managing living resources and their physical world, was not sustainability but simple persistence. I learned, for example, that we could have detected and averted a collapse of cod populations off Newfoundland, avoiding the social and economic upheaval that in fact occurred. Or, we could have anticipated and avoided a western sub-continental outbreak of bark beetles that are now destroying stands of lodge pole pine throughout British Columbia and Alberta. Both of these examples were dominantly caused by the slow consequence of earlier development and exploitation, by the ingenious, but myopic foraging of fishers and harvesters, and by decades long fire protection policies. Those slowly and invisibly led to reduced resilience, poising the systems on the edge of an instability state which began to unravel in a stutter of local spatial collapses and outbreaks, each stutter hidden by fast and innovative fishers and tree harvesters, until the whole system followed the stutters and collapsed at all scales. 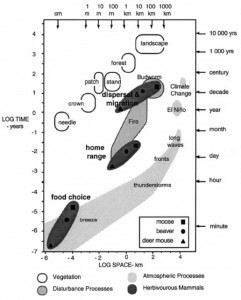 That has forced a new paradigm that led to theories of resilience, to adaptive complex systems, to integration across scales from fast and small to very slow and big– from the needles of trees over months, to the boreal forest over millennia, That new resilience paradigm led to management of resources that was adaptive, where the unknown was large, alternatives could be proposed and monitoring was essential. That is all part of complex adaptive system theory. It reflects humanity’s partial knowledge, fast inventions for dealing with surprises, and persistent learning. It applies to the present turbulence in the world now. Slow economic processes have led us to the big surprises now appearing on a global scale. Financial collapse, debts threatening nations, European deep instability, and climate change. Since the Berlin Wall fell, and the Soviet Union collapsed, corporations began to focus on fast economic variables and on globalization. That led to an emphasis on expanding efficiency but also to the emergence of slowly increasing debt, and hidden forces caused by diversified, subdivided and fragmented investments. No one knew where they were, or what they cost. That eventually triggered a collapse that exposed the reality that slow, invisible changes had decreased the resilience of the world economy. Globalization spread the collapse. What was presumed to be efficient began to be realized as being myopic. At this turbulent time of crises, you and I have a real purpose. We need to help minimize and slow the spread of the collapses in the face of resistance from lobbies and from accumulated wealth. Banks and investment firms need regulation and a richer paradigm, but that need is opposed by the entrenched powers of corporations and banks that are caught in a rigidity trap. Nations of the European Union, and the Euro, need an integrated, multi-scalar inter-relationship, but one that now encounters the loss of resilience that comes in part from the inability to devalue a single nation’s currency and little control on debt inflamed growth. Carbon dioxide emissions need to be inhibited, but that encounters the opposition from the fossil fuel corporations- particularly oil. Our aboriginal cultures and small communities here on the west coast are discovering and protecting treasured histories and traditions of local cultures. They now need to also add and create novel new ways to see and act beyond their traditional scales at the mouths of rivers and to connect to others across scales. Does fear stop them? Could their traditional theory (and myths) combine with adaptive resilience theory (and myths) as an emerging synthesis? The answer is to keep trying, keep talking, keep communicating, but recognize it is a frustratingly slow process. Understand the traps- poverty traps like Haiti, rigidity traps like Fascism, lock-in traps of mega agriculture, and gilded traps from external subsidies. And here is a program specifically for you. Encourage and support experiments, a multiplicity of experiments that search for and deepen new paradigms. Be entrepreneurs, alone and cooperatively together. And make the experiments global and cross scale. The internet and its novel ways of helping people to interact lets us reach or create groups of participants independent of where they live, ones from multiple patches and multiple time senses. Many experiments will fail, but make them safe in their failure. Look for rare synergisms between a few successes. When enough people and experiences have accumulated, then protest publicly, non-violently and simultaneously against the defenders of the old paradigm that created the crash, the flip. Make it our Big Arab Spring. The Project … recognises that shocks can provide opportunities for progress, not just negative consequences. Amongst the inputs from which the final report will draw are six background papers and case studies on the following themes: Systemic Financial Risk ; Pandemics ; Cyber Risks ; Geomagnetic Storms ; Social Unrest and Anticipating Extreme Events. I haven’t read these reports (which are available through the links above), but they look interesting. For example, prolific complexity scientist John Casti wrote the report on Anticipating Extreme Events. thanks to Victor Galaz for the tip. Two of the big questions of global history are why did the industrial revolution happen, and why did it happen in NW Europe? I’ve been partial to the explanation offered by historian Kenneth Pomeranz in his 2000 book The Great Divergence: China, Europe, and the Making of the Modern World Economy (here’s Cosma Shalizi’s review) that China and Europe were quite similar and industrial revolution in Europe is largely explained by the accidental discovery and then imperial conquest of new world by Europeans. Stanford archaeologist and historian Ian Morris has a new popular world history book, Why the West Rules—For Now: The Patterns of History, and What They Reveal About the Future, that similarly proposes that geography has been the main factor shaping history. He takes a longer view and argues that the aspects of geography matter depend on social development. In the videos below he outlines the thesis of his book in a short publicity interview from Stanford and a longer lecture at the RSA . (Here’s a review from the Economist). Finally, Morris surprises us. … what really concerns him, it turns out, is not whether the West may be bested by the East, but whether mankind’s Promethean collective developmental abilities may not end up being our common undoing. The competition that East and West have been pursuing for so long, Morris warns, is about to be disrupted by some powerful forces. Nuclear proliferation, population growth, global epidemics and climate change are in the process of radically altering old historical patterns. “We are approaching the greatest discontinuity in history,” he says. … Morris counsels that we now need to concentrate not on the old competition between East and West, but on a choice. We must decide between what Morris, borrowing from the writer Ray Kurzweil, terms “the Singularity,” salvation through the expansion of our collective technological abilities, and “Nightfall,” an apocalypse from the old Five Horsemen aided by their new accomplices. He warns that this choice offers “no silver medal.” One alternative “will win and one will lose.” We are, he insists, “approaching a new hard ceiling” and are facing a completely new kind of collective historical turning point. … Scientists aren’t sure what will happen when a significant portion of the Arctic Ocean changes from white, sunlight-reflecting ice to dark, sunlight-absorbing open water. But most aren’t sanguine. These experts are especially concerned that new patterns of air movement in the Arctic could disrupt the Northern Hemisphere’s jet streams — which are apparently weakening and moving northward. This could alter storm tracks, rainfall patterns and food production far to the south. The limited slack in the world’s food system, particularly its grain production, can amplify the effects of disruptions. Remember that two years ago, when higher oil prices encouraged farmers to shift enormous tracts of cropland from grain to biofuel production, grain prices quickly doubled or tripled. Violence erupted in dozens of countries. Should climate change cause crop failures in major food-producing regions of Europe, North America and East Asia, the consequences would likely be far more severe. Policy makers need to accept that societies won’t make drastic changes to address climate change until such a crisis hits. But that doesn’t mean there’s nothing for them to do in the meantime. When a crisis does occur, the societies with response plans on the shelf will be far better off than those that are blindsided. The task for national and regional leaders, then, is to develop a set of contingency plans for possible climate shocks — what we might call, collectively, Plan Z. Some work of this kind is under way at intelligence agencies and research institutions in the United States and Europe. Harvard’s Kennedy School of Government has produced one of the best studies, “Responding to Threat of Climate Change Mega-Catastrophes.” But for the most part these initiatives are preliminary and uncoordinated. We need a much more deliberate Plan Z, with detailed scenarios of plausible climate shocks; close analyses of options for emergency response by governments, corporations and nongovernmental groups; and clear specifics about what resources — financial, technological and organizational — we will need to cope with different types of crises. If so, a Plan Z for this particular scenario would help us make the most of the opportunity. It would provide guidelines for regional and local leaders on how to respond to the crisis. We would decide in advance where supplies of water would be found and who would get priority allocations; local law enforcement and emergency responders would already have worked out lines of authority with federal agencies and the military. Then there are the broader steps to mitigate climate change in general. Here, Plan Z would address many critical questions: How fast could carbon emissions from automobiles and energy production be ramped down, and what would be the economic, political and social consequences of different rates of reduction? Where would we find the vast amounts of money needed to overhaul existing energy systems? How quickly could different economic sectors and social groups adapt to different kinds of climate impacts? And if geoengineering to alter earth’s climate — for example, injecting sulfates into the high atmosphere — is to be an option, who would make the decision and undertake the operation? Looking over the endless, empty horizon of the Arctic, I find it hard to imagine this spot being of any importance to global affairs. But it is just one of many places now considered marginal that could be the starting point for a climate shock that plays a central role in the evolution of human civilization. We need to be ready. See previous RS posts on Homer-Dixon’s work here. The Resilience Alliance website has pointed to an interesting working paper from Alex Haxeltine, and Gill Seyfang from the Tyndall Centre in the UK Transitions for the People: Theory and Practice of ‘Transition’ and ‘Resilience’ in the UK’s Transition Movement, whose focus on developing transition towns to respond to the challenges of climate change and peak oil we have covered before on this blog. The specific language used is of “rebuilding resilience” – drawing on historical descriptions of towns in the UK around 100 years ago, the handbook argues that resilience has been decreased in recent decades. The narrative describes how localised patterns of production and consumption (and the associated skill sets and community cohesion) were eroded in a relentless shift to ever larger scale industrialized systems of production and consumption, made possible by the use of fossil fuel energy sources. Hopkins argues that there is now a great urgency to the need to rebuild resilience because of imminent disturbances (or shocks) in the form of peak-oil, climate change, and the associated impacts on economic systems and trading patterns (Hopkins, 2008). He links this urgency directly to our current oil dependency: “it is about looking at the Achilles heel of globalization, one from which there is no protection other than resilience: its degree of oil dependency” (Hopkins, 2008). These initial resilience indicators rely heavily on equating resilience with the re-localisation of systems of production and consumption. So the Transition Handbook could be said to provide a starting point for talking about resilience in a Transition Town, but it is still a long way from being clear about what is needed in practice. Furthermore the evidence from observation of the local Transition groups (during 2008-2009) is that they are in an equivalent situation of trying to frame multiple actions in terms of the building of resilience but relying heavily on equating resilience with a re-localisation of production-consumption patterns. Resilience theory highlights the fact that building resilience to a specified disturbance (such as Peak Oil) does not necessarily provide the same resilience to all possible disturbances. Some properties of a Transitioning community, such as strong community networks and diverse skill sets, may help provide resilience to most disturbances, while other properties may be very specific to one disturbance. If one were to take the position that the greatest shocks in the coming years may, in the end, turn out not to be the ones that we expected, then successfully building a specific resilience to an expected threat (such as Peak Oil) may not provide resilience against realized disturbances. So what may be required is to build resilience to specific threats in a way that also builds system properties that help in coping with diverse possible threats – implying, for example, a need for a capacity to innovate. The current framing of resilience equates resilience with localisation in a rather unquestioning way, as demonstrated by the resilience indicators given in the Transition Handbook. We would argue that increasing any one of these indicators could actually either increase or decrease resilience to a specific disturbance, depending the exact nature of the disturbance and on the exact systemic changes used to enhance the indicator. We also argue that the desirable goal is not to simply increase such indicators as much as possible, but to find the right balance between resilience and other goals, such as quality of life and well being. Rob Hopkins founder of the Transition movement has a long interview with Neil Adger on resilience, peak oil, and climate adaptation on Transition Culture. Neil Adger is a professor in Environmental Sciences at the University of East Anglia and a member of the Resilience Alliance (Neil briefly explains social resilience in a video here). RH: I was reading a piece of yours yesterday where you wrote “some elements of society are inherently vulnerable, and others are inherently resilient.” What is it that determines the degree to which things are vulnerable or resilient? NA: First of all both vulnerability and resilience need a referent, so we need to be vulnerable to something, or resilient to something. I think the things that parts of society are vulnerable to are environmental change at the large scale, and the changes in the way the world and society works, which you can capture in the idea of globalisation. Some parts of society are, in effect, vulnerable to the large scale structural changes that are happening around the world – the changes in the flows of capital and labour and the restrictions on those, and the impact that that has on their life and livelihoods. So if you think about the farming sector, it’s vulnerable to large scale price shocks, and we as consumers are vulnerable to large scale price shocks around the world. Some parts of society are vulnerable to environmental change and in combination are vulnerable to the sorts of things that are going on in terms of economic globalisation around the world. Others are more resilient. But being resilient to the forces of globalisation doesn’t necessarily mean that those parts of society are immune to them or even aren’t integrated into them. I don’t think you can simply isolate yourself from the globalised world and say, “well, that’ll make us more resilient”. It’ll make us more resilient in some senses, but the world is as it is and I think we just need to deal with the fact that it’s more globally integrated and look on the positive side of that and reap the benefits of it. Would you not have any truck with the idea that a resilient society is one where local economies are stronger? I don’t disagree with that. What I’m saying is that local economies, for all sorts of reasons, are actually stronger and likely to be more resilient, because if we go back to the definition, they have more autonomy and room for self organisation and adaptability and change. Hence, I think it’s impossible to isolate a community or society from a globalised world. Simply looking to give more autonomy to a community is a positive thing, but trying to isolate it from the rest of the world and not realise that we’re globalised and all the rest of it isn’t a sensible thing to do. As I say, there are a lot of benefits to globalisation (not necessarily economic globalisation) such as the flow of information around the world, global solidarity with places in other parts of the world. There are all sorts of up sides to globalisation. I’m sure you’re familiar with all those arguments and you know this on the ground.